strategies to face related geopolitical uncertainty. In the first part, we established that the paradoxical logic of strategy turns threats into opportunities, while constraints become drivers and systems of challenges are transmuted into powerful attractors. Here, continuing using strategic thinking, we shall see first how the implementation of the Arctic Russian strategy triggers different kinds of resistance: i.e. Clausewitz’s “friction”. The way this friction is absorbed, or not, by the implementation process determines the future degree of success of the strategy. Then, we shall explain how the Russian authorities are redefining the Russian national interest in a time of climate change – an evolution that is here to last – thanks to the understanding of the paradoxical logic of strategy as developed in part 1 and of the dialectics between the implementation of the Russian strategic project and the friction it triggers. for energy extraction, as well as for transport, and shipping on the Northern Sea Route and from the Siberian coast to Central Asia. This friction comes from the systems of difficulties inherent to the region, which always threaten the material organisation and implementation of the Arctic development. As a result the different operations constituting the development of the Arctic are forced to be able to absorb a very high level of friction to avoid disruption. For example, in the Yamalo-nenets province, the Siberian heat wave of the 2016 summer melted dead carcasses of reindeer, infected with the dangerous, and potentially deadly Anthrax bacteria. More than forty people were infected, and, sadly, a 12 years old child passed away, while 2300 reindeer also died, triggering a major health alert and sanitary response. This alert was particularly important, because an epidemic in the north of Siberia would be both dangerous for the people and the animals and disruptive for the Russian Arctic strategy through the disorganisation of the workforce used to build the infrastructures necessary for the creation of the Yamal LNG plant, and for the related railways and ports (Rebecca Joseph, “”Zombie” Anthrax not only deadly disease that could re-emerge as Siberia permafrost thaws”, Global News, August 16, 2016). 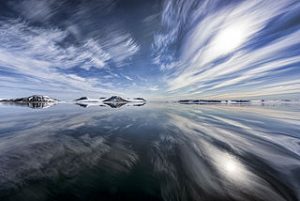 The violent storms, which interact with the multiplication of icebergs coming from the melting and breaking of the ice cap, are another major driver of friction, at sea this time. This is the case, for example, for the vastly expensive Prirazlomonoye offshore oil rig in the glacial Pechora Sea (Michael Klare, The Race for What’s Left, 2012). However, the Russian scientists and engineers have found two categories of answers to this challenge. First, they have studied ways to divert the icebergs by towing them. Second, they have invented floating barriers able to protect the infrastructures (Atle Staalesen, “Rosneft Moves 1 Million Ton Big Iceberg”, The Independent Barents Observer, October 11, 2016). Furthermore, the friction known by the Prirazlomonoye operation is not only environmental, but also political: in 2013, during a media campaign aimed at raising international awareness about the industrial development of the Arctic, Greenpeace activists attempted, without authorisation, to climb on the rig in order to protest against the industrial exploitation of the pristine Arctic environment (“Freed Greenpeace Arctic detainees home from Russia”, BBC News, 27 December, 2013). Activists were arrested and detained in Murmansk for three months by the Russian authorities, after having been condemned for piracy (Ibid.). wastes on the platform, which are recycled and reused in the industrial process in order to avoid any spill in the fragile ecosystem. This system is also much more cost-effective, because the wastes do not have to be shipped on shore. 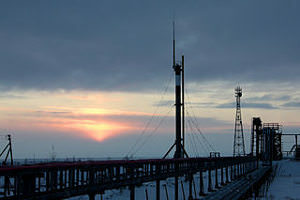 As a result, the Prirazlomonoye platform is the first Russian “zero emission” oilrig. (Trude Pettersen, “Prirazlomnoya “zero emission” system launched”, The Independent Barents Observer, April 12, 2016). As such, “friction” becomes a driver for innovation and thus a support for marketing the new Russian energy technology, when, at long last, ecological issues have become a real international concern as well as an economic imperative (Charles Emmerson, A Future History of the Arctic, 2010). Thus, this new generation of Russian oil rigs not only overcomes the environmental and political friction it triggers with an extreme and fragile environment, but is also a political and media tool to reinforce the legitimacy of the Russian Arctic strategy on the international scene, in a period of evolving tensions between Russia, the European Union and the United States. Advertising the technological response to industrial-environmental friction is strategically used to ease some of the geopolitical and commercial frictions triggered by the international political situation while supporting the marketing of the Russian innovative technology. Understanding the strategic nature of the Russian Arctic development and how it absorbs the friction engendered by the contact between its operations and an extreme environment leads us to the third level of strategic understanding: the nature of the political and economic project that is being implemented and its time-scale. 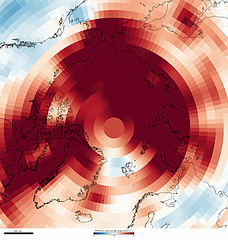 The combination of the warming of the Arctic and of the Russian political, industrial, military, infrastructural, and commercial projection of power in order to develop this region has a multitude of national and international consequences, notably through the multiplication of Chinese investments, and the signature of high-level technical, commercial and energy partnerships with India, Japan, South Korea, Vietnam, Thailand, and Singapore (Atle Staalesen, “Japanese, French credits for Yamal LNG”, The Independent Barents Observer, 02 December, 2016). The international impacts of the Russian Arctic project unfold at the international level, in the political, industrial and business spheres and interact with each other. For example, the Chinese shipping convoys of the COSCO Company or of South Korea have led the Indian government to sign investment deals in the Arctic with the Russian government (Atle Staalesen, “A Role for India in Russian Arctic”, The Independent Barents Observer, October 18, 2016 and President of Russia, Russian- Indian Talks). A similar phenomenon is at work with Japan (Wrenn Yennie Lindgre, “Energising Russia’s Asia Pivot: Japan-Russia Relations, Post Fukushima, Post-Ukraine“, Norwegian Institute of International Affairs, 4/2015). The immense Russian Arctic endeavour projects its influence on the whole of Asia and Europe, while turning Russia into a power base in the age of global warming. Our analytical strategic approach makes us understand that, through its Arctic project, Russia installs itself as an essential driver of the Asian development and growth (Jean-Michel Valantin, “The Warming Russian Arctic: Where Russian and Asian Business and Strategies Converge?“, The Red (Team) Analysis Society, November 23, 2016). In other terms, the integral nature of the Russian Arctic development makes it a “grand strategy”, allowing its supporters to wield geopolitical influence. Russia works at becoming one of the great world powers by using the current planetary crisis as a power and economic basis. For those political, industrial, financial and other business actors (Anne Ackerley, “Long term thinking in a low return world”, Black Rock, October 17, 2016), which are looking for new, sustainable and long-lasting “success frontiers” in a world of growing uncertainties, this is an essential point to understand. This is all the more important that these rising uncertainties are generated and intensified by the rapidly shifting state of international political and economic current conditions and by their interactions with the changing planetary conditions (Jean-Michel Valantin, “Planetary Security, or the Subversion of Collapse”, The Red (Team) Analysis Society, October 26, 2015). So, the Russian Arctic is becoming a region where these extreme changes and risks are being strategically turned into conditions for industrial and business success for Russian actors. Furthermore, this is also highly likely to be true for Russia’s partners, as these are going to partake not only in the costs but also in the benefits of the medium and long-term effects of this grand strategy. In fact, industrial and business success is now the very glue of the Russian strategy for a long-lasting success in terms of national interest, which integrates political, strategic, economic and business interests in a common grand strategy (Jude Clemente, “Russia’s Oil Production Won’t Falter“, Forbes, June 29, 2016). This can be seen, for example, in the case of the Yamal LNG plant, developed by the Russian Novatek, Rosneft and Gazprom, French Total and the Chinese CNPC and Silk Road Fund. These industrial actors are all confronted with the friction triggered by the specific conditions of the Arctic. The frozen ground – the permafrost – is rock solid in winter but melts during summer. The technological answer to face these changing conditions, in normal Arctic weather, i.e. not considering climate change, is the installation of the plant on metal poles, which will partly sink in the melting permafrost during summer, thus allowing for maintaining the stability of the structure (Anne Feitz, “Dans le grand nord Russe, le projet gazier géant de Total sort de terre”, Les Echos, 22/05/16). However, climate change must now be considered. 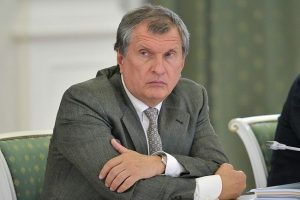 The Novatek company, in charge of the implementation of the project, has thus willingly launched itself into a race against time: its executive officers are perfectly aware that the warming of the region will warm the permafrost too much and that the infrastructures will not be able to maintain their integrity, while the rising of the sea level will put the flat peninsula under water and the industrial operation will not be technically sustainable anymore. Thus, in order to prevent these emerging risks, the industrial operations will have to be operational before the new impacts of climate change develop. Meanwhile, in order to see the operations remain sustainable, executives will certainly have to engage in important adaptation measures (Atle Staalsen, “Climate change could jeopardize Yamal gas development, Government fears”, The Independent Barents Observer, September 15, 2016). In other words, the Yamal project is a part of the Arctic – i.e. territorial – Russian strategy, which is also now a climate change-based strategy. Hence, the gas operation must be implemented and its benefits must be reaped before the next phase of the climate destabilization. Time – and not any time – becomes a crucial element. Indeed, this project is developed according to a time frame which is dependent upon the very conditions of the project: before the moment when the friction due to climate change will make it unsustainable. This anticipation supports the Russian power of attraction because it turns the current degree of climate change into an opportunity for the Russian industry and for Russia, as well as for their numerous Asian and European partners. Here again, a strategic analysis points out how the Russian authorities identify and use the current phase of climate change as an industrial window of opportunity and how they behave accordingly, in order to make this project profitable for its national and international investors. However, the Arctic – as well as the entire Human-Earth system – is still highly likely to evolve quickly. In other words, the success of tomorrow must remain sustainable, while its original conditions are highly likely to keep changing. For example, the way the accelerating melting of the Arctic polar pack ice is going to create more and more icebergs could generate such a new potential danger, which would need to be analysed in-depth through scenario analysis. These icebergs, through their sheer number, would be highly likely to threaten the security of the offshore drilling operations, as well as of the shipping convoys using the Northern Sea Route. This would imply that, for example, a LNG ship leaving the Yamal peninsula for China, Japan or India could be slowed, and the energy supply chain of entire countries could be under pressure. This would paradoxically turn the success of the Russian Arctic development into a new risk for Russia and for its partners. To prevent such a type of dangers, as well as the related uncertainties, it is necessary to think strategically, thus to recognise how the friction created by an endeavour can turn a success into a failure, or, more precisely, into a system of cascading failures. To achieve this kind of thinking, it is of paramount importance not to deny reality, but on the contrary, to fully accept it. That is why, for example in answer to the risk evoked above of multiplying icebergs, the Russian Gazprom and Rosneft, as well as Chinese and South Koreans, are building new generations of nuclear icebreakers, which will be able to protect the shipping convoys of the “friction” induced by changing sea conditions (Atle Staalesen, “Aiming for Year Round Sailing on Northern Sea Route”, The Independent Barents Observer, December 14, 2015, RT, “Russia Floats Out Arktika Icebreaker, set to be world’s largest”, 16 June, 2016, Atle Staalesen, “COSCO Sends 5 Vessels Through Northern Sea Route”, The Independent Barents Observer, October 10, 2016, and Jean-Michel Valantin, “Arctic China (1) – The Dragon and the Vikings”, The Red (Team) Analysis Society, 24 May, 2014). 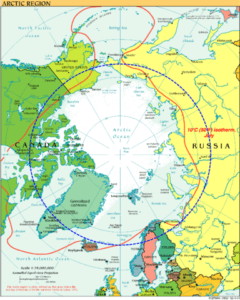 As we have seen, the strategic analysis of the Russian Arctic development is a thinking that is absolutely necessary to be able by integrating it within the proper methodology to produce diagnostics that integrate the new dynamics enforced on government and business actors by the current planetary crisis. These methodological tools allow us to anticipate major uncertainties, which are currently happening through the combination of historically powerful environmental, political and economic factors, and which have a very high potential of disruption for governments as well as for business. As a result, the best possible adaptation to survive and even to thrive may follow. About the author: Jean-Michel Valantin (PhD Paris) is the Director of Environment and Security Analysis at The Red (Team) Analysis Society. He is specialised in strategic studies and defence sociology with a focus on environmental geostrategy. 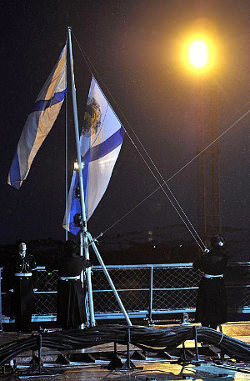 Featured image: “During a staged naval performance to mark Navy Day.” President of Russia Trip to Severomorsk. 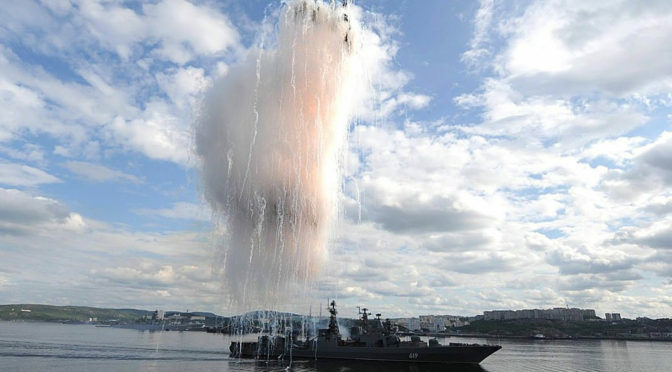 Navy Day celebrations – July 27, 2014 Severomorsk. Kremlin website.